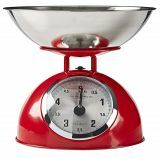 Kitchen scale KASC111SI, digital, 5kg, LCD display, temperature sensor Electronic kitchen scales with LCD display, temperature sensor and timer. With silver color, measuring up to 5 kilograms and accuracy 1 gram. 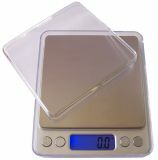 Kitchen scales, analogue, max 5kg, accuracy 25g Retro kitchen scales with accuracy of 25g and range up to 5kg. Red color with a stainless steel bowl. Digital luggage scale, 50 kg, thermometer Compact luggage scales with thermometer, max 50 kg, measuremnts in kg. and pounds. 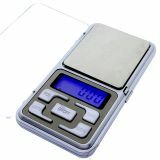 Electronic pocket scale to 500 g Professional electronic mini scale, up to 500 g with a resolution of 0.01 g.
Electronic pocket scale MH 300 Electronic pocket scale MH 300.